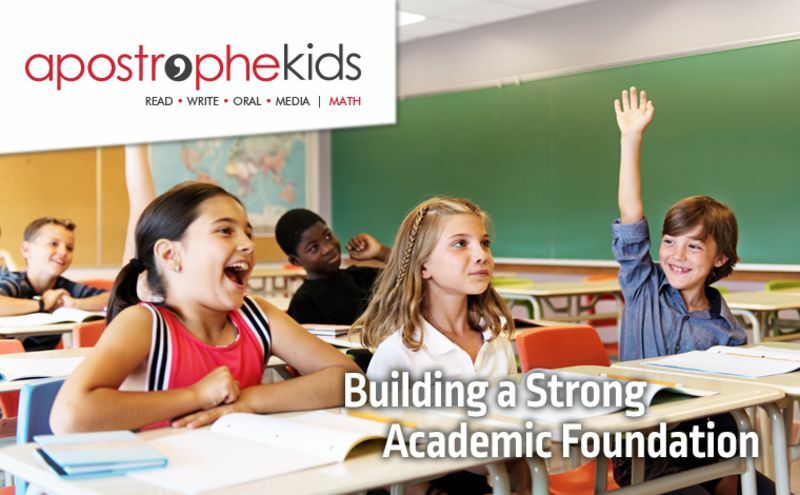 At Apostrophe Kids, we believe strong language skills will translate to successes in other subject areas such as solving word problems in Mathematics, researching for Social Studies, writing reports for Science, and public speaking throughout their academic career. STEM and STEAM get a lot of attention these days, though how we express our ideas is just as important as how we arrive at them. Appreciating a well-crafted argument, and writing in a longer form than a tweet, is a key skill that kids will need to succeed in post-secondary and beyond, yet often can receive short shrift. At Apostrophe, kids have a chance to really drill down on effective communication, while also exercising a natural affinity for text, story-telling, and stories, with peers who share that area of interest. The first time I knew Apostrophe Kids was making a difference with my child was when I met with his school teacher. She mentioned that she has noticed a difference in his confidence during his weekly spelling tests. He told her that he does weekly spelling tests at Apostrophe Kids, an after-school program he was a part of. His confidence has grown so much that she started to give him words from an advanced list. She noticed a difference during his Daily 5 work. The expectation is to write sentences for the weekly words. She said that his sentence structure has become stronger and his sentences have greater details and expanded vocabulary. When she started teaching paragraph writing in class, she said he just got it! She spoke about his oral presentations and how in his earlier presentations he was reading his notes but in his more recent presentations he comfortably speaks to the audience with little reference to his notes, therefore keeping his classmates engaged from start to finish. I was thrilled after speaking to her. I want to thank the teachers at Apostrophe Kids for all of their hard work. It is definitely paying off at school! When we decided to have my son join Apostrophe Kids, our hope was that he would build greater confidence in his public speaking skills. Now that we are nearing the end of his first year at Apostrophe Kids, he is walking away with so much more! My son is an enhanced learner however, he does not always put in his best effort into his work. During his time at Apostrophe Kids I have seen a change in how he approaches his work. He actually enjoys reading the weekly reading comprehensions, working on the novel studies, creating the oral presentations and presenting in front of the class. This year I saw improvements in his spelling. When he does written work I have noticed that the vocabulary he taps into has grown immensely. When he first started, his sentences were very simple. Now he takes pride in writing complex sentences that are becoming more creative as the weeks progress. When asked to do presentations, he takes the time to practice his delivery, which is greatly encouraged by the teachers at Apostrophe Kids. The teachers also gave an opportunity for students to present their final book report in a variety creative mediums. My son chose to combine his presentation with a commercial he created. The quality of his presentation was incredible! More importantly he had a blast creating it. The teachers at Apostrophe Kids gave descriptive feedback on my son’s writing throughout the year so that we knew where there were improvements along with areas that still needed more focus and practice. The value of this feedback gave me, as a parent, a true insight of how he was performing. Most recently, my son worked on creating an essay. Writing has always been a challenge for him. The teachers knew just how to manage his learning style. By focusing on one paragraph at a time it took the pressure off of him to create one large piece of writing. When he was done, he had written a strong essay without feeling frustrated. I am so pleased at the learning I have seen with my son during his time at Apostrophe Kids. When my son looks forward to going to class each week, I know we made the right decision to join Apostrophe Kids! My daughter has showen great improvements since she began studying at Apostrophe Kids. As a non-native English speaker, she has progressed significantly with her English proficiency with the help from instructors at Apostrophe Kids. Most notably, she is writing in English with more confidence now. She is showing progress in word selection, paragraph structuring, and organizing ideas. We cherish the opportunity offered by Apostrophe Kids to foster her presentation skills. Presenting has always been a weakness for her and there is still a long way to go, but she is catching up with the rest of her peers. Teachers at Apostrophe Kids have been super patient and kind in guiding my daughter to become more confident in giving presentation in public. Reading is my daughter’s favourite after school activity. But only at Apostrophe Kids, teachers give detailed analysis and ask thought provoking questions of books, which brought her reading skills to a higher level. Thanks to the hard work of all staff at Apostrophe Kids, my daughter gained great progress in her English. We are expecting her to continue with her great learning experiences and particularly, become a good presenter. Over the past two semesters, our son has gone from constructing single sentences to multi-sentence paragraphs. He has learned how to collect all his ideas and effectively write them down. Using grade 4 vocabulary, that has advanced him well above his peers. His grade 2 classroom teacher has stated several times that he is reading at a grade 4 level. His teacher has also commented on how he’s the most improved student currently in her class. Our son’s reading has taken off to a new level. He can quietly sit down and read an entire 30 page book given to him by Apostrophe Kids, this on its own is a huge improvement. He used to get very frustrated with 10 page books, now he prefers to read at night over playing with his iPad. When we went on vacation this past winter break, he asked us to buy him a new novel to read while away, and you know what, he finished it. Apostrophe Kids has definitely made him very confident and encouraged his daily reading. There is no doubt that his spelling has dramatically improved. He has managed to ace all his grade 2 weekly spelling tests over the past few months. His teacher has also stated multiple times that he is extremely confident when speaking in front of the entire class. Our son has gone from a B- to a B+ to most recently an A+ in Language Arts from September 2018 to April 2019 on his report card. This makes him extremely excited to the point where he wants to finish his Apostrophe Kids homework and any reading and writing involved with school. Apostrophe Kids is a Language Arts and Math, academic enrichment program. Apostrophe Kids Language was developed by an Ontario Certified Teacher. Apostrophe Kids Language is designed for students ages 7 to 13, who have a passion for Language Arts and the motivation to learn. Apostrophe Kids Math was designed for Grade 3/4 students, who are looking for a math program that will challenge their problem-solving skills and who are interested in competing in math competitions participated by the brightest young minds from around the world. Our campus is located in John Knox Christian School, 2232 Sheridan Garden Drive, Oakville. Apostrophe Kids is a 36-week program. Our program runs from September to June and is divided into two terms. Term one begins in September and term two begins in February. Classes are held once a week. Apostrophe Kids Language is held on Thursday's and Apostrophe Kids Math is held on Tuesday’s and are 90 minutes in length. Apostrophe Kids Language curriculum has a foundation built on four key components: Reading, Writing, Oral Communication and Media Literacy. All four components are weaved into every level. The skills that they will develop and the learning that they will take away will be transferable to all subject areas in their educational experience making them well-rounded students with the added advantage of being a step ahead. Apostrophe Kids Math curriculum covers topics such as: Number Sense and Numeration, Measurement,Geometry and Spatial Sense, Patterning, Algebra, Data Management and Probability. These strands are presented through typical questions used in the Canadian Math Kangaroo Contest and Caribou Contests. Through the use of critical thinking students will develop problem solving skills. Students will be encouraged to participate in independently sanctioned math competitions throughout the year. Apostrophe Kids is taught by Ontario Certified Teachers. Our teachers pride themselves on offering their knowledges along with praise and encouragement to ensure students are inspired to learn. Through ongoing in-class and descriptive feedback they build individual student learning. With a low student to teacher ratio, teachers create a safe environment for students to explore and take risks. Our mission is to cultivate, lead and inspire our students to become world-class thinkers and expert communicators, deliver a challenging and exciting curriculum that exceeds Ministry expectations, foster a love of learning, and help students realize and maximize their potential. To learn more about Apostrophe Kids, visit our website at www.apostrophekids.com. Let us answer any questions you may have and or book a free assessment, to get you one stop closer to your child's future. We can be reached by phone 416-799-3736 or e-mail [email protected]. Your child's future begins here! We look forward to preparing them for tomorrow.